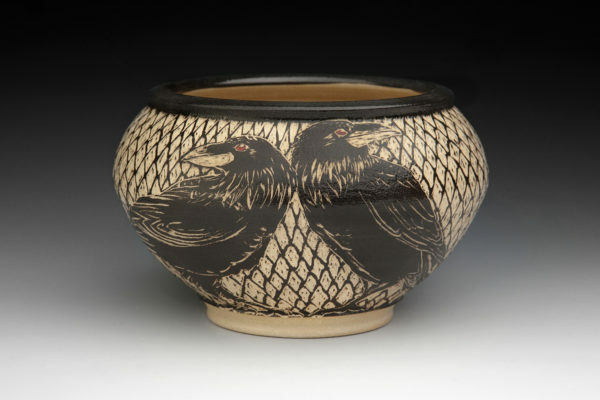 Judy Anderson works with stoneware clay. She strives to make elegant, wheel-thrown forms that then serve as a canvas for surface decoration. Each piece is unique. A form of decoration made by scratching through a surface to reveal a lower layer of contrasting color, typically done in plaster or stucco on walls, or in slip (colored clay) on ceramics before firing. This enables her to capture animals and other nature-inspired images in a way that often resembles the look of a woodcut print. The images of the collection created for the Lanesboro Arts Gallery include flora and fauna found in the area. The dragonfly holds particular meaning for Judy as a personal totem and good luck symbol. Judy teaches beginning ceramics in Minneapolis. She supports several “Empty Bowls” charities every year.